Dubai is home to some of the most beautiful wonders of the world. With so much to see, a major portion of your holiday would be dedicated to sightseeing. However, if you are travelling with your children, you would have to check out the things to do in Dubai that would interest them too. While Dubai has several attractions and activities dedicated to kids, nothing is better than water parks for a fun family holiday, and Dubai has some of the best water parks in the world. If your kids are complaining about all the sightseeing and walking they have to do, perhaps it is time to take a break and visit one of the Dubai water parks. Nevertheless, before you begin any sort of planning, make sure you apply for Dubai visa online for your whole family, even the really young children. When you are planning to visit a water park, make sure that you have a complete day dedicated for the same. There is no point in visiting a water park if you do not have enough time to enjoy it to the fullest. Visiting a water park is a leisure activity and the perfect way to have a relaxed time. If you are looking for a water park that is right in the middle of the city, the Wild Wadi Water Park is your best bet. Located close to Hotel Burj Al Arab and Jumeirah Beach Hotel, this water park is on a prime location. The park is based on the theme of Juha, an Arabian folklore, and is home to more than 30 exciting rides and attractions. The most amazing slide is the Jumeirah Sceirah, which is the tallest waterslide outside USA. Apart from this, there are other thrilling raft-based slides and waterslides that would satisfy the adventurer in you. The park also has two surfing simulators, a 360 meter lazy river and the largest wave pool in the Middle East with five configurations. There is also Juha’s Dhow and Lagoon, which is a play area complete with water games and slides, for little children. The only downside about Wild Wadi Water Park is that it can get really crowded during the weekends (Friday and Saturday). Hence, it would be better to plan your visit on a weekday. If you want to visit a water park that has something adventurous and exciting for adults as well as kids, you would not find anything better than Aquaventure. Located at Hotel Atlantis, the Palm, this water park is considered to be the best and the largest water park in Dubai. Complete with adrenaline-pumping slides, pools and play areas, you are sure to have an amazing time at this water park. The highlight of the park is Leap of faith, a slide with a vertical drop of 27.5 meters. While you take a steep plunge, you would also be able to see sharks while passing through the shark’s lagoon. If you are not interested in the slides and pools or want to take a break, you can also visit the Aquventure Beach or the Lost Chambers Aquarium. For those seeking more adventures, there is the Atlantean Flyer Zipline, which is the longest in the whole of Middle East. Whatever your likes and dislikes, the Aquaventure would definitely give you an exciting and memorable day. 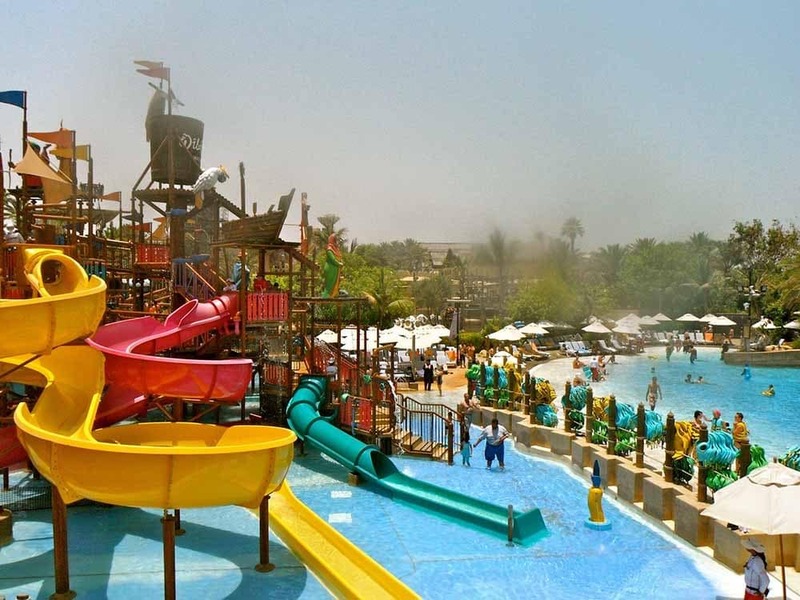 If you think that Aquaventure and Wild Wadi would be too much for your little children, then you would find the LegolandWater Park to be ideal. Suitable for children between 2 to 12 years of age, the Legoland Water Park is a part of Dubai Parks and Resorts. The best part of this water park is that it has several interactive attractions, making it fun for both children and parents. Apart from sliding down the numerous water slides and playing in the pool, children can get creative and build a boat using huge Lego blocks and test their durability in the water current. They can also build a raft using soft Legos and float in the lazy river. In short, there is lot of fun stuff to do in the Legoland Water Park, which the kids would definitely love. The Laguna Water Park stands out amongst the other water parks of Dubai as it sits on a beach. 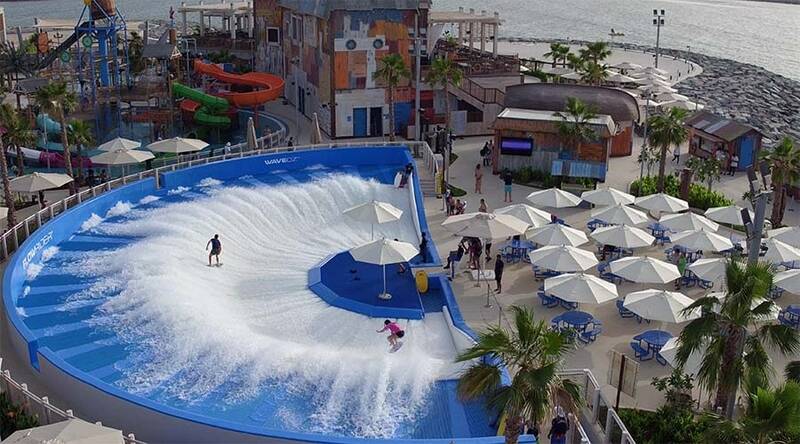 Located in La Mer, a beachside locality in Dubai, the Laguna Water Park is a new addition to the city’s water parks. Although not as huge as the other water parks of Dubai, it is packed with lot of exciting rides, pools and attractions. The park is divided into four zones, namely Slide, Splash, Surf and Relax. The names of some of the major attractions of this water park are WaveOz 180 FloRider (a 180 degree surf simulator), Lazy River, Free Fall, Manta (a giant raft ride). Moreover, if you want to take a break from the rides and slides, you can also visit the beach. This is the best water park to visit in Dubai if you are on a budget holiday. Apart from these water parks, Dubai also has several splash parks that are ideal for younger children. They are also great if you do not want to wait in long lines and queues to enjoy a ride. Some of the splash parks in the city are Splash Island by Blue Wave DXB, Splash ‘n’ Party Dubai and Splash Pad, The Beach JBR, etc. With so many water activities in Dubai, it is a great place to have a family holiday. All you have to do is book your tickets, get your visa, pack your bags and get ready for an amazing holiday in the Emirate city of Dubai.